MoMA brings together some 400 works for the first major exhibition in the United States dedicated to socialist Yugoslav architecture. NEW YORK, June 26, 2018—The Museum of Modern Art presents Toward a Concrete Utopia: Architecture in Yugoslavia, 1948– 1980, the first major US exhibition to study the remarkable body of architectural work from Yugoslavia that sparked international interest during the 45 years of the country’s existence. On view from July 15, 2018, through January 13, 2019, the exhibition investigates architecture’s capacity to produce a shared civic space and common history in a highly diverse, multiethnic society through more than 400 drawings, models, photographs, and film reels culled from an array of municipal archives, family-held collections, and museums across the region. Tasked with constructing a socialist society based on “self-management,” modern architecture was a key instrument in the implementation of a utopian vision in a perpetual state of emergence; many of the featured visionary projects and executed buildings speak to architecture’s aspirational role in terms of both design and social impact. Toward a Concrete Utopia: Architecture in Yugoslavia, 1948–1980 is organized by Martino Stierli, The Philip Johnson Chief Curator of Architecture and Design, The Museum of Modern Art, and Vladimir Kulić, Associate Professor, Florida Atlantic University, with Anna Kats, Curatorial Assistant, Department of Architecture and Design, The Museum of Modern Art. With galleries dedicated to Modernization, Global Networks, Everyday Life, and Identities, the exhibition explores themes of large-scale urbanization, technological experimentation and its application in everyday life, consumerism, monuments and memorialization, and the global reach of Yugoslav architecture. Featuring work by exceptional architects, including Bogdan Bogdanović, Juraj Neidhardt, Svetlana Kana Radević, Edvard Ravnikar, Vjenceslav Richter, and Milica Šterić, the exhibition examines the unique range of forms and modes of production in Yugoslav architecture and its distinct yet multifaceted character. In addition to architectural work, Toward a Concrete Utopia also includes three video installations by renowned filmmaker Mila Turajlić, newly commissioned photographs by Valentin Jeck, and contemporary artworks by Jasmina Cibic and David Maljković. “Historically speaking, a thorough investigation of the architectural production of socialist Yugoslavia will lead to a better understanding of an important but understudied chapter of architectural history in the bifurcated world order of the Cold War,” said Martino Stierli. Toward a Concrete Utopia focuses on the period of intense construction between Yugoslavia’s break with the Soviet bloc in 1948 and the death of the country’s longtime leader Josip Broz Tito in 1980, which coincided with the emergence of postmodernism in the region. Given the country’s diversity, Yugoslavia’s architects responded to contradictory demands and influences, developing a postwar architecture both in line with and distinct from the design approaches seen elsewhere in Europe and beyond. Situated between the capitalist West and the communist East, Yugoslavia circumvented the Cold War dichotomy, instead spearheading a “third way” through its leading role in the Non – Aligned Movement, an organization of countries formed in 1961 not formally aligned with and critical of any major power bloc. Simultaneously, the government undertook rapid modernization at home with an array of building efforts that sought to grow the economy, improve the daily lives of Yugoslav citizens, and engage with the diverse cultures in the region. The state expanded these efforts beyond its borders, advancing urbanization and building projects throughout the developing world, notably in other Non – Aligned countries in Africa and the Middle East, where Yugoslavia cultivated political connections and construction contracts. 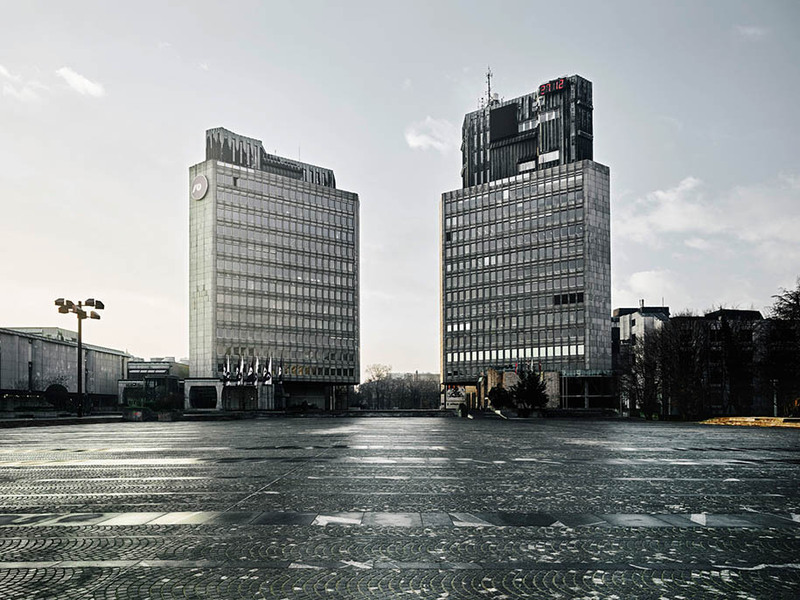 The architecture that emerged — from International Style skyscrapers to Brutalist “social condensers” — is a manifestation of the radical pluralism, hybridity, and idealism that characterized the Yugoslav state itself. In the 1960s, MoMA presented a series of programs featuring Yugoslavia, most notably the 1969 exhibition Yugoslavia: A Report, which brought to an American public 45 contemporary prints by 24 Yugoslav artists. In addition, two film series, in 1961 and 1969, respectively, investigated the country’s rich experimental cinema of the day. Part of MoMA’s ongoing effort to reassess the history of modernism from a global perspective, Toward a Concrete Utopia explores how architecture was used in socialist Yugoslavia to create a common history, collective identity, and vision for community in a multi-ethnic state with opposing needs and influences. Press Preview: Tuesday, July 10, 9:30-11:30 a.m., with remarks to follow.